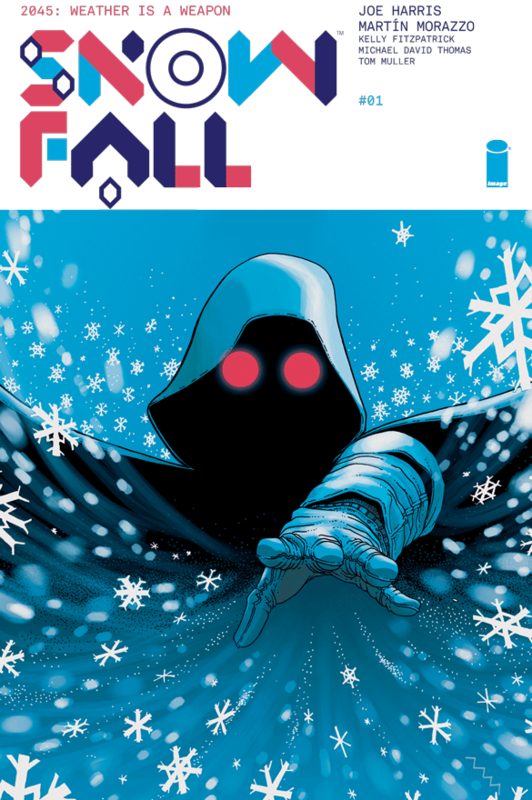 Mixing the mystical with the futuristic, Snowfall is an interesting twist on what happens when our climate goes to hell, and big corporate has control of the government. Upon first glance, it feels like a fairy tale world, with its bright artwork and very first words promising such. But upon reading past the first couple pages, it proved to be anything but. The story quickly goes from glittering snowfall, to a desperate world of the future, the year 2045. The world is different now, with climate change showing its true wrath. The United States government has failed its attempts at controlling the weather, and the “Cooperative States of America” is formed, backed by the Hazeltyne Corporation. The Cooperative is committed to building a stronger nation, by combating every threat (be it natural or man-made) using the latest weapon technologies supplied by Hazeltyne. A mysterious snow starts to fall in New York, and the Cooperative faces a new threat they have never seen before. At the same time, a young college student is desperate to get to the bottom of the mystery himself, but there may be more at stake than anyone else knows. We are all familiar with the corporate owned government too often seen in futuristic dystopian stories. In Snowfall, we get something a little bit different. We get a glimpse of a world that a government has tried to force its power, but has failed. A world where the weather can be controlled by forces greater than Mother Nature herself. With the first issue, it is an exciting start to what looks to be a promising series.